Product drying applications include two general types: bulk drying and continuous drying. In bulk drying the material is loaded into a compartment and the entire load is dried as a batch. With continuous drying the wet material is continuously fed into a drying chamber and material continuously leaves the chamber, dried to the desired moisture level. The quantity of air needed for proper drying will vary widely with either type of drying system. But the drying characteristics and the approach to the problem are similar. The Bry-Air Dehumidifier performs no miracles extracting moisture from the product into the surrounding air. But by maintaining the air at a lower moisture level, the Dehumidifier can increase the drying potential and the drying rate. More important, it can remove the variable of weather as a factor in a drying operation. 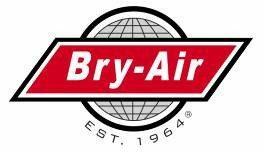 Heating is less expensive than drying, so the obvious question is: Where do Bry-Air Dehumidifiers apply? In most drying processes, the released moisture goes into the air and must be physically removed or diluted with outside air. However, without a desiccant dehumidifier, the lowest possible moisture level in the chamber will equal that of the outside make-up air. But in practical terms, the air in the chamber will generally be somewhat higher than that of the outside air. When heat is used alone, the drying potential is limited by the specific humidity of the outside air plus the safe temperature to which the product can be raised. Generally, a proper drying potential can be established with heat and outside air if the temperature can be raised to 140°F or above. If the temperature cannot be raised over 120°F, then a Bry-Air Dehumidifier is the best solution. For temperatures in the 120° to 140°F range, the decision depends on the product characteristics and the desired degree of dryness. Drying operations involve the removal of free moisture, hygroscopic moisture, or a combination of both. Free moisture is water held on the surface or between molecules of a substance. Free moisture occurs when actual liquid water is used to mix or wash the product prior to drying. Hygroscopic moisture is held within the material’s cells. Hygroscopic moisture will take up or dispel water in relation to the relative humidity of the air mixture to which it is exposed. When in equilibrium with air at 100% RH, the material will be hygroscopically saturated. Any hygroscopic material containing free moisture must be hygroscopically saturated. The removal of free water is a surface evaporation function. The surface water temperature should be assumed to be the wet-bulb temperature of the surrounding air mixture. Note that air velocity is critical to the drying speed. The removal of hygroscopic moisture depends on the relative humidity difference between that of the products’ equilibrium condition and that of the surrounding air. Velocity of the air over the product has little or no bearing on the drying speed. The figure below shows a typical drying curve. The sudden change in drying rate (at the critical point) denotes where the initial drying via removal of free moisture ends and hygroscopic drying takes over. In other words, the product has lost its free moisture, but is still hygroscopically saturated. Each material has a different physical form that determines how it holds or gives up moisture. Since many of the newer materials lack published data on their drying rates, selecting appropriate air drying equipment must be done experimentally. The net effective drying surface and the hygroscopic properties cannot be determined in any other way. Most drying problems are really a request for improving the speed or quality of an existing drying operation. For example, before today’s advanced dehumidifying equipment was available, candy manufacturers could make their product only in winter. In summer, attempts to manufacture candy might often end with a moldy product. Now, to meet production demands, the use of cooling equipment and a desiccant dehumidifier can imitate winter conditions all year. Solving a drying problem usually involves a rather simple analysis of the drying cycle. If the analysis (that is, the test run) can occur during weather conditions that consistently give the desired drying result, the problem is simplified. Regardless, any test run will show the product’s characteristics and give clues for solving the problem. The test run should be made under actual production operation to secure information in either of the two following categories. Several trays in different locations in the compartment should be weighed and identified before being placed in the drying cabinet. They should be weighed at the start and at predetermined intervals (usually hourly), subtracting the tray weight, and quickly returning the tray to its original position after weighing. At the same time a wet- and dry-bulb reading (average throughout the cabinet) and air velocity reading over the product should be taken. Continue these procedures until the product is satisfactorily dried; weight should be noted at this point. The purpose is to establish a totally dry weight. Temperature should be high enough to keep the RH in the surrounding air at 5% or less. Here one must remove material samples at the start, finish, and at regular intervals along the drying tunnel. Such test points should be accurately marked and related to the drying time. Each sample should be weighed as soon as removed, then thoroughly dried at elevated temperature and reweighed. The dry-bulb temperature, wet-bulb temperature, and air velocity over the product should be determined at each point of product supply as well as at the start and end of the drying tunnel. From this information the weight readings can be converted into percent of moisture and plotted against drying time. Moisture content should be expressed as a percentage of the product’s bone dry weight, not as a percent weight of the test sample. If both free and hygroscopic water are removed from the sample, a characteristic curve will resemble that shown in Figure 1. Bulk type drying. On the characteristic curve, indicate the wet-bulb and dew-point temperatures equivalent to the reading taken during the test up to the critical point. From the critical point to the curve’s end, show the dry-bulb temperature and the RH. The hygroscopic drying phase should be considered in making the first analysis (that is, the drying curve). The product is substantially in equilibrium with the final RH at the end of the test (when it reaches the desired moisture content). If our test took 12 hours and we want it to be complete in 8 hours, or two-thirds the amount of time, then the hygroscopic portion of the test, which took 9 hours, needs to be completed in 6 hours. Further, the product’s moisture level at the critical point minus the moisture remaining after complete drying equals the total weight of water to be removed in 6 hours. This amount can be converted into grains per minute. The average product RH combined with the average dry-bulb temperature dictates the specific humidity that must be maintained and defines the operating conditions for the Desiccant Dehumidifier. The Bry-Air Dehumidifier will handle a mixture of recirculated air (at the average specific humidity already determined) and a minimum of 5% outside air. This establishes the level at which the dehumidifier must operate. From the Typical Performance Curves chart, the leaving moisture is determined. The difference between the grs/lb. moisture level maintained in the dehumidifier and the same parameter in the air leaving the dehumidifier is the pick-up factor. This figure divided into the average required moisture removal (in grs/min determines the dehumidifier size in lb/min air capacity. Knowing the desired drying temperature helps pinpoint the inlet where the necessary moisture removal will occur. For example, if 42 gr/lb. must be removed (the drying temperature is 95°F), then follow the 95°F curve to the point where the difference between the inlet and outlet moisture is 42 gr/lb. Here the result is nearly 60 gr/lb. that is where the leaving moisture is approximately 18 gr/lb. To be safe, use a condition approximately 5 gr/lb. above that shown on the curve and allow for 5%outside air. Then the needed dew-point and wet-bulb temperature values can be established. Determine the vapor pressure equivalent for the temperatures using the difference between these items establishes the drying potential. Then determine the average vapor pressure difference for the test run from the same table using the test dew-point and wet bulb readings. The ratio of vapor pressure difference with the Bry-Air Desiccant Dehumidifier over that measured during the test should equal or be greater than the ratio of the drying time (test vs. desired). Since air velocity also affects free moisture evaporation, drying can be somewhat controlled by changing air velocity to as high a level as possible without disturbing the product. Use a by-pass or fans within the chamber to increase the total circulation in the drying air circuit above the Bry-Air Dehumidifier’s capacity. At any given vapor pressure difference, the evaporation will vary directly according to the above factors. Continuous drying. Since continuous drying systems characteristically have open ends, they usually require a great deal of additional outside or make-up air to compensate for all the openings. For efficiency, keep such openings as small as practically possible. A minimum leakage equivalent to a 200 fpm velocity through the area should be positively introduced into the system. The typical flow pattern for a continuous drying operation, shown below, has a separate circulating system for free moisture removal; the dehumidifier discharge is directed through the hygroscopic moisture phase. This configuration takes advantage of rapid circulation in the first space without carrying the wetter air into the final drying space. Note the separate circulating system for the free moisture removal stage dehumidifier discharge is directed through the hygroscopic moisture phase. This arrangement allows rapid circulation in the first space without carrying over moisture into the final drying space. Use the bulk drying method to establish the vapor pressure difference to allow drying to proceed satisfactorily in the free moisture stage. Keep the velocity and temperature as high as practical. Design specifications will help establish the total circulation. The temperature, plus necessary vapor pressure difference, will establish the specific humidity (in gr/lb.) that must be maintained. Express the total product moisture removal in gr/min and add the moisture load introduced by make-up air. This latter load derives from the difference in specific humidity between the maximum design outdoor level and that maintained in the compartment multiplied by the quantity of outdoor air (in lb./min). The proportionate quantity of recirculated and outside air also determines the specific humidity of the mixture-which typifies air entering the Dehumidifier. The next step is to check the performance of the Dehumidifier in the hygroscopic drying section, measured in grs/min. Use the curve in the Typical Performance Curves chart to determine the temperature of air leaving the dehumidifier. The departing moisture will have a cooling effect; to find the average temperature subtract 0.625°F for each grs/lb. pickup. Now that moisture content and temperature are known, the average RH needed is easily determined from a psychrometric chart. Compare this figure with the necessary RH to insure proper drying within the bulk type dehumidifier. This comparison will reveal whether or not the dehumidifier has the capacity to produce the desired drying rate. Maintaining drying temperature. As already noted, water evaporation is a cooling process. Approximately 1052 Btu are needed to evaporate one pound of water. In other words, 6.65 gr/lb. represent 1 Btu or 1 grs/lb. represents 0.625°F. As a product is dried, it releases moisture. Without proper control, this moisture can cool down the environment and result in an equilibrium condition where the drying practically ceases. So to maintain drying temperatures, heat must be supplied in an amount represented by the evaporation rate. Also, heat can be lost by conduction through cabinet walls. Thus it may be necessary to control the product to drying temperature (heat or cool it), and heat the make-up air to maintain the optimal drying temperature. The process of adsorption is an exchange of heat in a like amount in the reverse direction. Thus, air heats as it passes through the desiccant dehumidifier. Approximately 30% additional heat builds up in the desiccant from the previous reactivation period, so the dehumidifier supplies all the required heat for evaporation and an additional 30% for other purposes. In some instances that additional heat is required; in other cases, cooling may be needed. Several methods provide dehumidifier control. On/off control of the dehumidifier. Humidistat or dew-point control monitoring of space or return air is a method used where continuous process air is not needed. Often the dehumidifier is installed as an independent unit and is not tied into the make-up or outside air circulation system. On/off control of reactivation heaters and blower. This control method applies to continuous process air flow situations. However, the process air will have more variation in humidity than with other control methods. Modulation of reactivation inlet temperature. This strategy yields reduced energy consumption and supplies the minimum energy needed to maintain the process condition. Modulation of reactivation inlet temperature and air volume. By modulating the reactivation air volume and temperature at specific values, the reactivation capability is increased and can be used over a wide range of operating conditions. This method also compensates for reductions in adsorption capacity. Process face and bypass damper control. Here the moisture control of leaving air is due to varying the volume of air that bypasses the dehumidifier. However, a constant supply air volume must be maintained. This is the best scenario for tight humidity control. Information in this manual was prepared to help customers choose the most effective and efficient dehumidifiers. 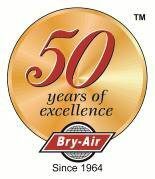 Please contact Bry-Air’s dehumidifier experts for additional assistance and for more detailed information about physical characteristics and performance data relating to Bry-Air Dehumidifiers.